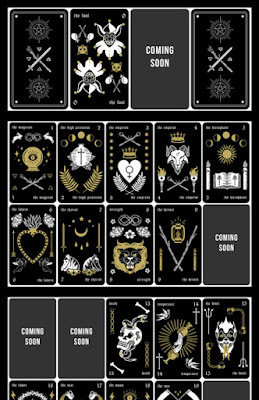 Gilded Ink Tarot© combines tarot divination with the style traditional tattoo flash. Each cards keeps symbolism and tradition in mind while adding a spooky, modern twist. About one month remains in the campaign and it is about 50% funded. This deck is unique in that it really sticks to tradition in terms of art, tattooing, and tarot. Keeping some of the original symbols found throughout the deck makes reading a more intuitive experience for the reader. Gilded Ink© is comprised of 78 cards, both Major and Minor Arcana. Each card is printed on 300GSM matte black paper with gold details hot stamped. Each deck comes in a matte tuck box. Choosing a matte lamination allows for the gold details to really pop and stand out in this deck. Here's the breakdown for the $4,500 goal listed on the Kickstarter site: 75% of production of deck plus shipping to the creator, 10% of Kickstarter fees, 10% of shipping to you, 5% of production of rewards. Rewards that you can opt into when you pledge include mystery stickers, a copy of Gilded Ink Tarot Deck©, a calendar, and other bundles for yourself and/or friends. A stretch goal of $5,000 will give each deck owner a velvet bag for their cards if this extra goal is hit. 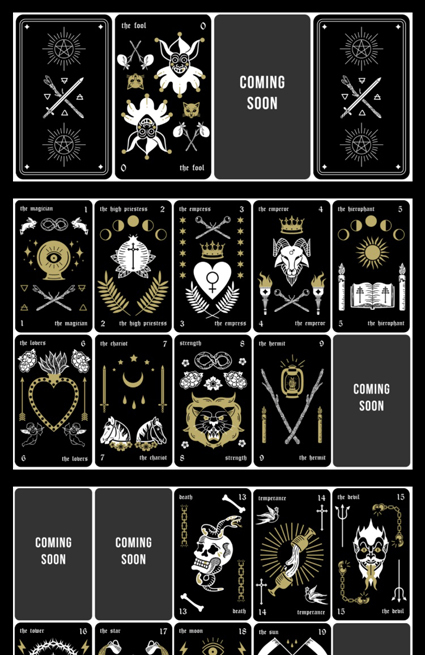 Gilded Ink Tarot© is owned by an independent artist, Nicole Zadykowicz. This is her first crowdfunding campaign and hopefully a successful one! She hopes to continue with her graphic design career and is interested in pursuing a career in the tattoo industry as well.